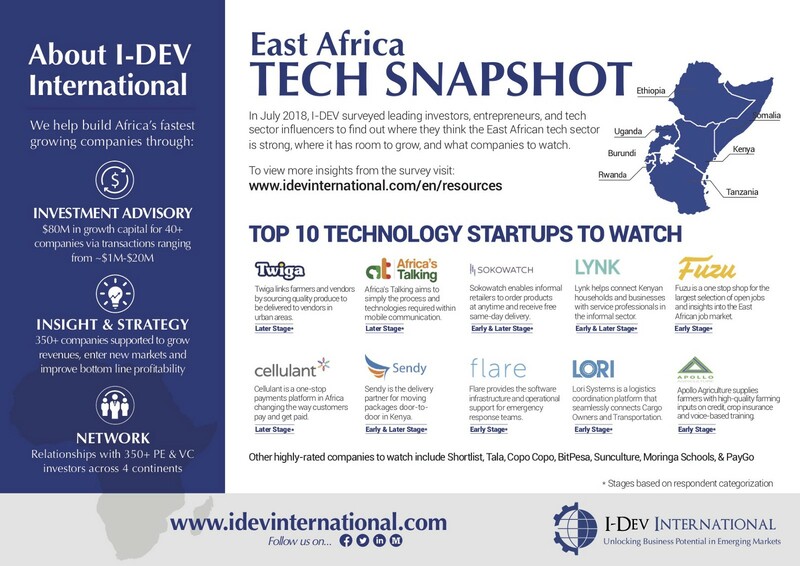 About the ‘East African Tech Snapshot’ Series: In July 2018, I-DEV surveyed leading investors, entrepreneurs, and tech sector influencers to uncover key strengths, opportunities and companies to watch. The tech startup scene in the African continent is experiencing record-breaking growth and increased international attention. In 2017, African tech startups received over $560M in investment according to research by Partech Ventures (a 53% increase from $367M in 2016). While South Africa and Nigeria still lead in attracting tech investments for the continent, East Africa is rapidly grabbing diverting more attention and investment dollars, catalyzed by strong innovation hubs and incubators. Nairobi stands as the pillar and anchor of East Africa’s interest, attracting 26% of total investments into Africa. Results from I-DEV East Africa Tech Survey showed strong evidence that Kenya continues to take a the lead in attracting attention and growing the ‘hottest’ companies to watch in East Africa, yet Rwanda and Uganda are beginning to attract investor interests as well. When asked about the hottest companies to watch in East Africa, 95 % of the companies (77 of an incredible 82!) mentioned were Kenyan-based — an indicator that ecosystem thought leadership and knowledge is still focused predominately on Kenya. This article highlights the leading East Africa tech companies attracting survey respondents’ attention. From online career and recruitment platforms to providing software infrastructure for emergency response teams, the East African tech scene is targeting enhanced solutions and user experiences across a diverse range of sectors. The most prominent sectors for technology solutions are agriculture (Agtech), financial services (FinTech) and medicine & health tech. Other highly-rated companies to watch include Branch, OkHi, Shortlist, Tala, KopoKopo, BitPesa, SunCulture, Moringa School, & PayGo Energy. Networks and Contacts: Without networks and contacts, even the most innovative product may never gain the right sales traction until a solid network is developed to help market and support the company for securing investment and business support. Strong Management Team: The capacity and skillset of the management team are essential components for scale. A strong management team will develop the operational and financing plans needed to scale while also looking for unconventional solutions needed to achieve the shared vision. Access to Advice and Mentoring: There are many startups that may have an innovative idea but are unable to find success within their first year. This is attributed less to a lack of financing and more due to a lack of structured mentoring. While East Africa has invested heavily in incubator programs to offer mentoring guidance, in many cases, strong technical and strategic support from experienced professionals is hard to reach and too expensive for early stage startups. 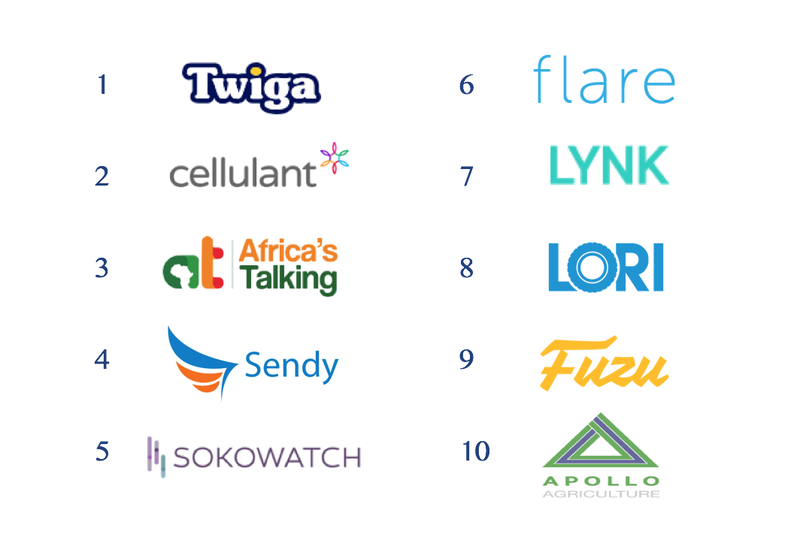 These are only a few examples of the emerging and ever growing East African startup ecosystem! The diverse and rich East Africa tech ecosystem continues to bloom, strongly centered out of Kenya! This seems to be driven by strong investments into the country into startup ecosystem building, and rich and improving services to graduate companies from launch to early growth phases. The hottest startups are- not surprisingly- tackling some critical bottlenecks that affect large populations in the region- improved agricultural yields and trade, supply chain logistics and formalization, talent development and sourcing, and mobile communications and mobile payment solutions. Keep an eye on these companies as they are primed for rapid growth! East Africa Tech Snapshot: Download here! ‘Inside the C-Suite’ Podcast: Featuring Ken Njoroge, Co-Founder & Group CEO of Cellulant on company’s rise to success. Listen here! Insights from I-DEV staff, partners, friends around the world. Focus includes Sub-Saharan Africa, Latin America and Asia. E & M-commerce, clean tech, agriculture, supply chains.